Heaven for cars, salvation for owners. For more than 25 years Paradise Garage has been providing the highest levels of personal service in the care of fine motors cars. Paul Lukes established Paradise Garage in 1990 with a vision to create a centre of excellence for the finest motor cars and a concept firmly developed to provide under one roof the ability to service your daily drive car, refurbish your special car, source your next car and provide all the support needed to enjoy safe and reliable motoring. Paradise Garage is a service driven organisation supported by a knowledgeable staff of real enthusiasts. 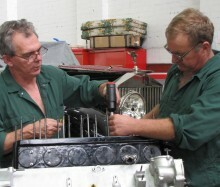 The dedicated service team for Rolls-Royce and Bentley are without piers, the most experienced team in the country. The Jaguar service team constantly demonstrate a rare ability in keeping Jaguar owners happy with their performance machines. Paradise Garage has cared for Citroen motor cars and their owners for more than eighteen years, providing expertise in Service and Parts. Expanding the French connection into the Peugeot marque, Paradise Garage’s Citroen and Peugeot service team continue to relish the advancing design and technology Citroen and Peugeot are putting into their cars – taking them to the next level of French motoring refinement. We have an established and continually expanding clientele of Range Rover and Discovery owners – people who prefer superior service and short waiting lists. We work hard to keep our waiting lists low – just phone for a time to suit you. We can often do minor services and repairs while you wait. Talk to our experts about your car. Are you happy with it? Is it performing to your expectations?